Although "Related Posts Widget" is important for all types of blogs, but in blogs where almost all the posts are similar (like blogs with articles on recipes, money-making, computer tricks or automobiles etc. ), visitors usually do not mind reading some quite-unrelated posts too. 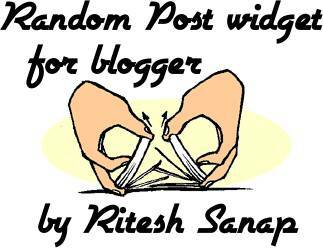 So along with Related Posts widget, a "Random Posts widget" on your blog will help you to increase the number of page impressions. Then Click on the Edit Link of Random post widget. Then Change the number from 6 to the desired number of posts you want to show. Friends if you like it then please share it and bookmark using social networking help best2know.info to grow.